Have you ever heard the saying "You get what you think about?" This is an absolute true statement. How did the device you're reading this on come about? How do we have cars now? How do you have shoes on your feet? They were all thoughts first. It HAS to be that way. There is no other way. If you can get this concept, then you're already ahead of most people and you'll have a much easier time learning how to earn more money. Because it starts with your thoughts first. I have been deliberately attracting things into my life since I was 7 years old. I didn't understand what I was doing at the time, but I knew that my thoughts were powerful. I am not anyone special. I'm a mom of 2 human kids and a bunch of fur kids. 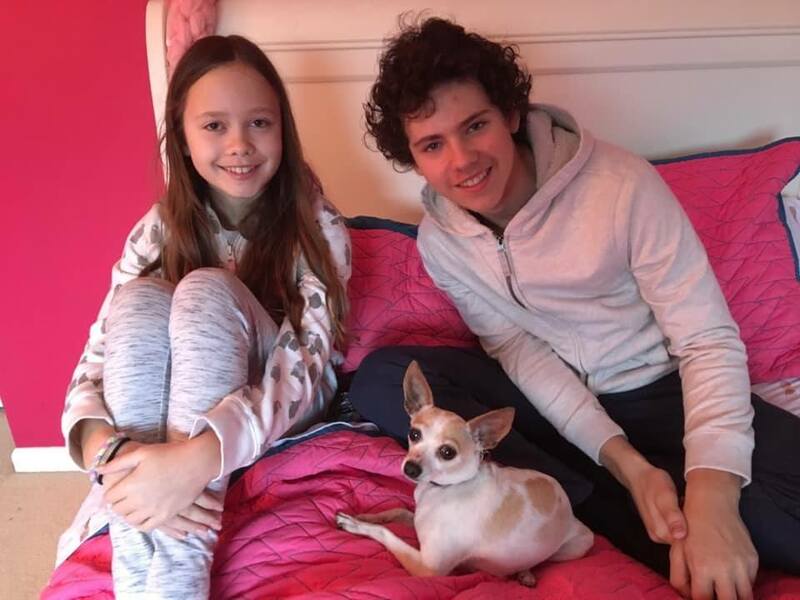 My kids with our dog, Luna. 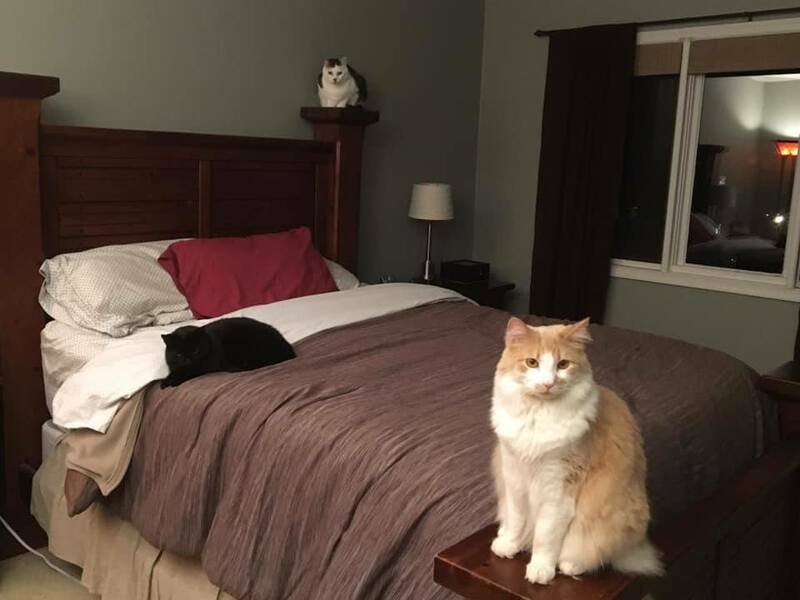 Our 3 cats taking over our bedroom. I am a wife to a great husband who I've been married to since 2002 and been together with since 1992. 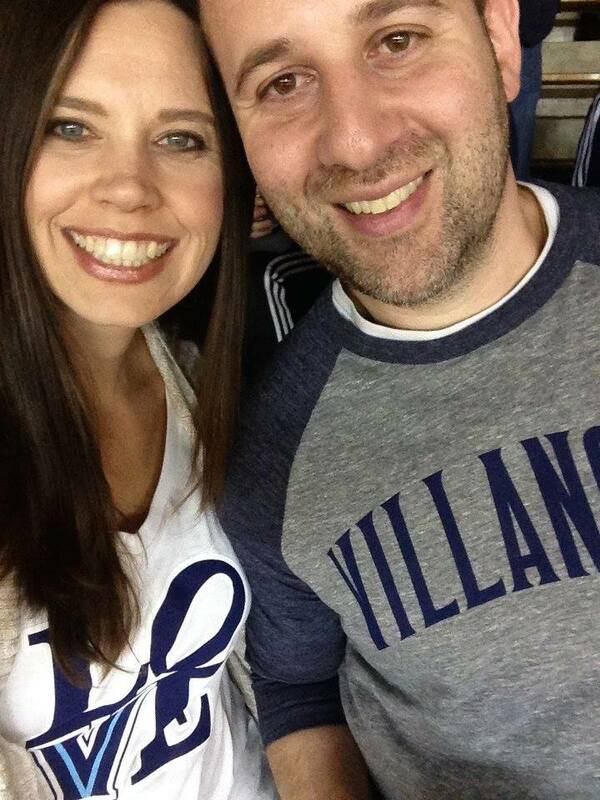 Nick and I at a Villanova basketball game. I live in the suburbs outside of Philadelphia and I drive a Nissan Pathfinder. None of that sounds like much, but I attracted all of that into my life deliberately, and I'm actually living a dream life. And it just gets better and better all the time. Now I'm on a mission to help you earn more money, work from home and have your own dream life. While I believe in earning money (by doing something you truly enjoy AND providing value to others), I also believe in letting money come in whatever way it wants. I have recently won 4 different jackpots in the past few months for: $4500, $1300, $1400 and $1000. Money is ALL around us. It WANTS to come to you, but you have to let it in. You do this through your thoughts. Why do some people have all the money and I have none? Do you know that every time you have these thoughts, you are attracting more reasons to have these thoughts into your life? In other words, the more you think these things, the more you will be shown reasons to think these things. Having more money starts with the thoughts you think. If you want more money, you HAVE to accept this statement. I know a lot of people grew up in a religious household where you're told that wanting money is a bad thing. Or that money is the root of all evil. Get that out of your head right now. Money isn't good or bad. It just is. The purpose of Nature is the advancement and unfoldment of life; and every man should have all that can contribute to the power, elegance, beauty, and richness of life; to be content with less is sinful. The man who owns all he wants for the living of all the life he is capable of living is rich; and no man who has not plenty of money can have all he wants. Life has advanced so far, and become so complex, that even the most ordinary man or woman requires a great amount of wealth in order to live in a manner that even approaches completeness. Every person naturally wants to become all that they are capable of becoming; this desire to realize innate possibilities is inherent in human nature; we cannot help wanting to be all that we can be. In other words, we WANT money and material things because those things help us expand, grow and allow us to live our lives to the fullest. It is perfectly OK to want better things for yourself. In fact, it's a desire that we ALL hold, and it serves a greater purpose. It not only helps us expand ourselves, but we can also help more people when we have more money. We can do MORE good with more money. Not only is it OK, it's necessary. I know that many of us were taught to save, save, save our money. Hoard it "just in case". Now, I'm not saying you can't save, but don't be afraid to spend it either. If there's something out there than can help you improve your life, it's OK to spend money on it. Just think about it like this. Say there's a pair of sunglasses you really want. By you buying them, you are supporting someone else's dream. Someone had a thought to create those glasses and they put in a lot of time and energy to design them, get them manufactured, and market them so that people like you can enjoy them. Be thankful that those glasses exist and you get to buy them! You don't want to hoard your money because there is something called the Law of Circulation. You put money out, and through this law, it HAS to come back to you. Next time you have bills to pay, be grateful that you get to use the services that they provide! What would we do without electricity, phones, internet, cars, heat and air conditioning? Instead of complaining about those bills, shift your perspective about them. I'm not saying go out on a wild spending spree and spend all the money you have. I'm saying if there's something that you really want (we don't actually really want that much stuff), then appreciate that someone created it, and find a way to buy it. We are SO lucky to live in this day and age. We have opportunities ALL around us. My in-laws came from Italy. They lived in a small town and didn't have any of the luxuries that we had. They basically had one option to make a living and survive - farming. Now we have computers, cell phones and the internet. You can make a MASSIVE amount of money with this technology. From the comfort of your home! If you think only certain people are able to make money online, that's not true. That's just your throughts getting in your own way again. Anyone can make money online. As long as you put in the effort. People start and are really excited and motivated, but they see that the money is taking longer than they expected (because they expect it immediately) and then they give up. They start but then get overwhelmed. They listen to the many, many naysayers out there and let them control their thoughts. They look for the next shiny object that can make them rich fast. They decided everything's a scam and give up on their dreams. And that's why your thoughts are the most important part to success. Because I can give you all the tools and training that you need, but you have to be able to hold your thoughts steady in order to push through the noise. Can you do that? If so, you can earn plenty of money. As much as you want. Now, I'm going to tell you where you can learn what to do. If you're not interested in affiliate marketing, then you might be on the wrong site! lol It's what I do and what I love. Imagine waking up every morning and it feels like Christmas because you have new notifications coming in of sales or referrals or even just comments on what you wrote about. Affiliate marketing is promoting and selling other people's products for a commission. For instance, if you're looking for a baseball bat online, you might read a blog post comparing the top 10 bats. You purchase one from the site you were on. The blog owner makes a commission. He or she doesn't need to hold the inventory, talk to customers, or any of the hard stuff. They just promote it and that's it! OK, it's not quite as easy as I'm making it. You have to create a site, write great content and attract visitors to it. But you are shown how to do ALL of this, step by step with the site that I recommend for training. Not only will you learn everything you need to know about making money online, you'll also have all the tools you need too. PLUS, you'll have the support of a community that has over 400,000 members. Think about that. ALL these like-minded people in one place. Imagine having your own piece of the web. That is an asset that you can keep forever, if you'd like. But you don't just have the opportunity to make money via affiliate marketing. Oh no. It's so much bigger than that. Use your the skills you learn to do freelance work. These are just a few ideas. There are more ideas inside the site. I Know What You're Thinking. "How Much Is This Gonna Cost Me?" You really need to get your thoughts in order! Here's thing. You can join as a Free Starter Member and it won't cost you anything. You can even stay a Free Member as long as you like. I like this because it gives you a chance to try things out and see if this is actually something that you'll enjoy. If not, I totally understand. We all need to find that "right" thing for us. I don't like it because when people are given things for free, they don't value them. Also, you cannot learn how to make a full-time income with a free account. Every single successful person I've ever heard speak has said this. Aren't you WORTH it? Aren't you worth investing in yourself for the future joy, satisfaction and riches that this can bring to you? You are just as worthy as anyone else on this planet. We have lots and lots of successful members. They make $1000, $5000, $10,000 a month and more. Someone just posted about how he used the skills he learned to create a course that made him $100,000 in a week. Yes, you read that right. $100,000. In. A. Week. The sky's the limit. Remember what I said above. Be grateful that someone thought of putting together this training to help others. Pay for it GRATEFULLY. It will MORE than come back to you in due time. Stop expecting everything for free. That is a LACK mindset, not an abundance mindset. You HAVE to have different thoughts about money in order to earn more of it. There is no other way. Are you ready to learn how to earn more money through affiliate marketing? Join free now to see if this is right for you. Then once you figure it out, upgrade to absolutely CRUSH it. All you have to do is hit that button right down there, and I'll help you get started living the life that you've always dreamed of. Remember, hold the thought of what you want in your mind (more money), and don't let ANYTHING stop you from achieving your dreams. P.S. If you're a scroll-to-the-bottom-right-away person like me, this won't cost you anything. You have absolutely nothing to lose. Why not give it a try? It could be the BEST decision of your life. P.P.S. Go back up and read the part about being OK with spending money and investing in yourself. P.P.P.S. If you want to see more about the membership site, I have a full review here. Enter your name and email address below to get instant access. Remember, it's 100% free. You won't even need your credit card. I HATE Spam, and I promise to keep your email safe with me! 🙂 You can opt out at any time.